Yum! Brands has overcome multiple tainted food scandals in China, but it might have dipped into the well of consumer goodwill too many times. Despite a series of mishaps, Yum! Brands' (NYSE:YUM) stock is on a seemingly inexorable march higher. It's a testament to the restaurant operator's KFC and Taco Bell chains that it can increase in value even after suffering through two major food scandals in China in as many years. The Chinese seem particularly forgiving, though: Even as sales faltered last quarter, with system sales dropping 6% on a 12% plunge in same-store sales, that was not nearly as bad as expected. In fact, that represented a pretty large recovery from the fourth quarter of 2014, when comps fell 16% and drove down system sales by 11%. While that's encouraging, and management expects the situation to improve further over the course of the year, here are three good reasons why Yum! Brands stock could fall. While outbreaks of avian flu in China have disrupted the operations of Yum! Brands, McDonald's (NYSE:MCD), and other fast-food chains over the years, U.S. performance has largely been immune. But a particularly virulent strain of the highly pathogenic H5N2 avian flu virus flared up domestically earlier this year and struck Midwestern poultry farmers particularly hard, resulting in more than 49 million birds being culled or dying in 15 states. The National Wildlife Health Center reported last week that as many as 1.2 million more birds have been infected. The die-off of birds is causing a significant egg shortage and higher prices, leading some chains like Whataburger to limit the hours when customers can buy an egg sandwich. So far the outbreak has bypassed birds raised for meat, leading to substantially lower prices for wings and legs, but agriculture officials expect the flu to reignite in the fall. If it makes the leap to fryer and broiler birds that could impact chains such as McDonald's and Taco Bell, which has made a big push into the breakfast daypart with its breakfast tacos and burritos. Primarily thanks to its new breakfast menu offerings, Taco Bell is doing quite well these days. According to Bloomberg, the daypart now accounts for about 6% of Taco Bell's overall sales, and last quarter the Mexican food chain's systems sales rose by 9% on the strength of a 6% increase in comps and 3% unit growth. Much of the strength came from breakfast, but also pricing tailwinds for commodities such as cheese and chicken. Currently a source of strength, if Taco Bell's growth slows or turns, Yum! Brands as a whole could sag. Yet if Taco Bell's breakfast menu turns out to be a novelty and can't sustain the torrid pace, it could very well cause the chain's overall performance to look weaker in comparison. That doesn't seem to be a concern at the moment, but it is something investors need to consider. 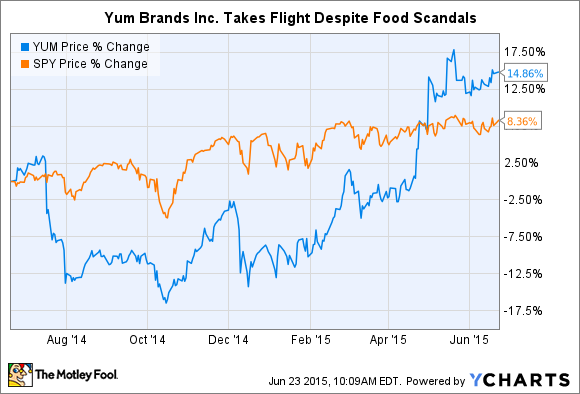 Activist investors have begun calling for Yum! Brands to calve off its Chinese division as a means of improving shareholder returns while minimizing risk from future food scandals. On the surface there are some good reasons to spin off the segment, even though it accounted for almost half of the company's total first-quarter revenue and more than a third of its operating profit. First, Yum! Brands owns a greater percentage of restaurants in China than it does in other markets where a preponderance of the restaurants are franchised. By separating the division, it could help develop the franchising market in China while allowing the stores to better represent regional flavors. The company would also have more financial flexibility to take on debt. But there's no guarantee it would be successful, and with KFC accounting for virtually all of Yum! Brands division revenue, further food scandals could doom the company to perpetually having to react without being able to take forceful steps to resolve these situations as it has in the past. With more fast-food competition and growing wariness toward foreign chains -- being non-Chinese was once a source of strength, but repeated scandals across the food industry have soured locals on them -- a separate Chinese company might drag on performance. Yum! Brands has showed surprising strength, bouncing back from what looked like a devastating body blow. But the restaurant operator still faces headwinds going forwward, and investors would be wise not to forget they could rear their heads at a moment's notice, if not all at once.